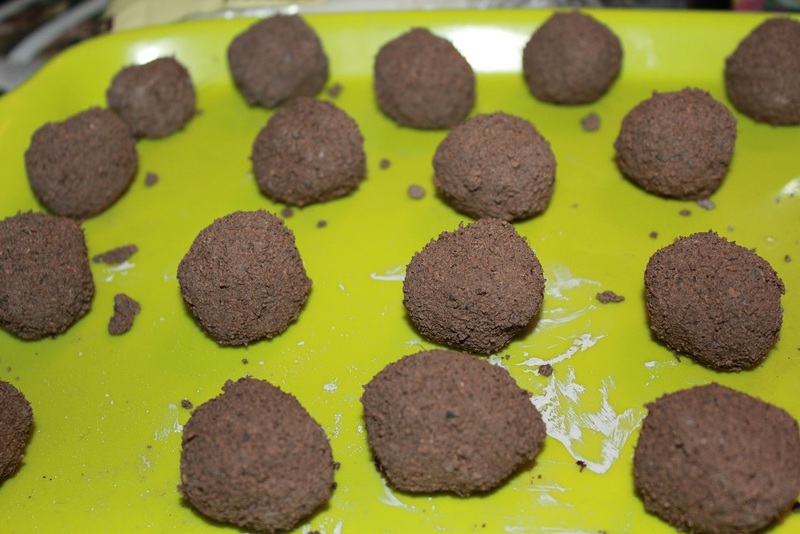 Seed bombs/balls are spheres of soil and clay with seeds inside. When dry, the sphere of clay and soil protects the seeds within. When they get wet, the seeds are stimulated to grow and they will break the sphere apart as they push out, giving the seedlings a perfect start. They are ideal for throwing into places where people can’t really get in to plant, and can contain any sort of seeds, however wildflower seeds are the best for helping the bees and butterflies in your local area. I received my first introduction to seed bombs via a recent random conversation with a friend, and I thought it would be an excellent idea to make some of my own with wildflower seeds to spread on our adventures walking through the countryside. 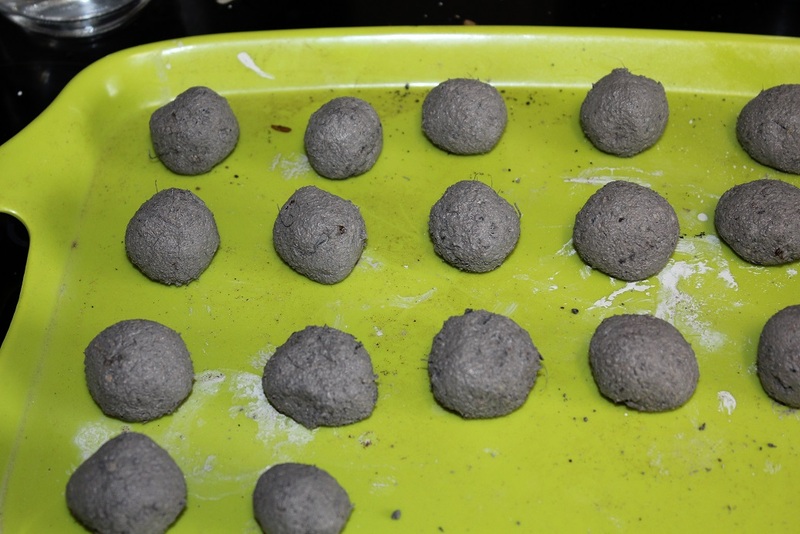 So of course, I consulted the Google with my query and found many pages with recipes for how to make seed bombs/balls, but they mostly seemed to involve clay powder, which I was having trouble sourcing. Then I remembered that I have a brick of non toxic air dry clay in my craft hoards, so I started looking for recipes using air dry clay. I found a few which basically walked me through how they made the balls, but none of them seemed quite right to me, and it made me feel fairly sceptical when I couldn’t find one actually confirming with photos that the balls germinated. I mean… anyone can chuck a few seeds in some clay and take photos, but the important thing about a seed bomb is that it actually facilitates the growth of the seeds inside. Below I’ve outlined what I did to create my own seed bombs (which are all sprouting nicely) using easily sourced materials in the UK. I’ve made my balls two different ways with the air dry clay, one using a miracle grow scatter mix and compost and the other using a packet of seeds and compost. Using the miracle grow compost/seed mix worked really well, but unfortunately there is no way to actually tell how many seeds are in the measured compost, so it’s a bit of a gamble. 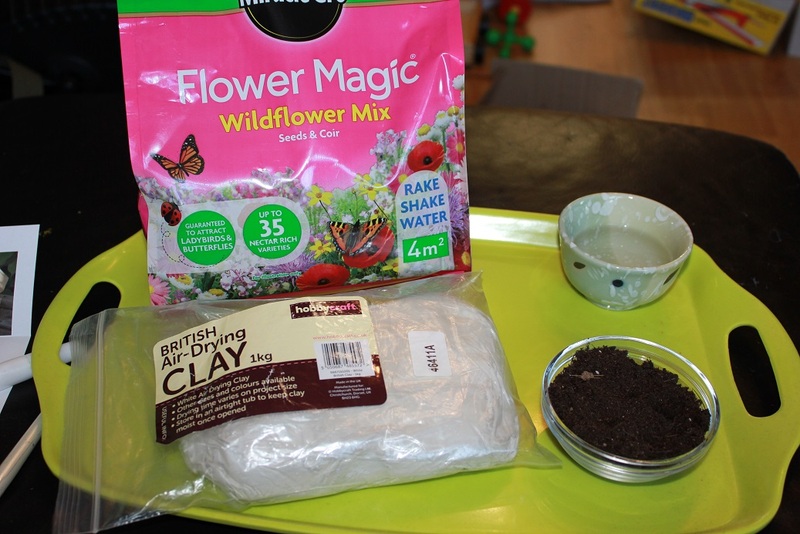 The clay that I used is from Hobbycraft, a local craft chain and runs about £3.75/kg… so it’s quite affordable, especially since making a batch of seed bombs will only use 100 grams of it at a time. It was too hard to really work like a dough, so I thought back to my elementary school days experimenting with clay and thought that it would work really well if I turned it into slip. Slip is just water mixed with clay, it’s usually used to bond two clay pieces to one another, but for seed bombs, it’s sort of just acting as the thing that will bond everything together as it dries out. My first recipe is for the balls made with miracle grow (wildflower magic) shake and rake. Yield is roughly 16-18 seed bombs. Mix compost and seed mix in with the slip. This should make you a nice pile of damp soil which can be gently squeezed and manipulated into ball shapes roughly one inch in diameter. If it’s too dry, add a bit more water, but be aware that it probably does not need additional water, even if you think it does. Using the miracle grow stuff, the balls will feel a bit gritty and dry on the outside, but it’s ok! Dry the balls on a plate or sheet for 2-3 days before distributing them in nature or storing them. I don’t actually know how long they will keep for when storing at this point as I have made mine with the intention of gifting them and using them right away! I burst one of them by applying gentle pressure as i was curious as to how many seedlings were growing inside the ball besides the one I could see popping out the side, there were 4! These rolled out in my hands a lot easier than the ones made with the miracle grow compost which were a bit gritty and they were a lot easier for my 6 year old daughter to help me with as well. 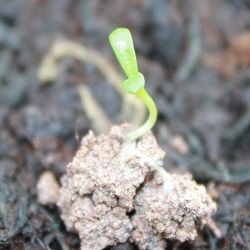 My balls from this last batch started showing seedlings only two days after they were made and they weren’t even totally dried out yet… I must have bought some very eager seeds! 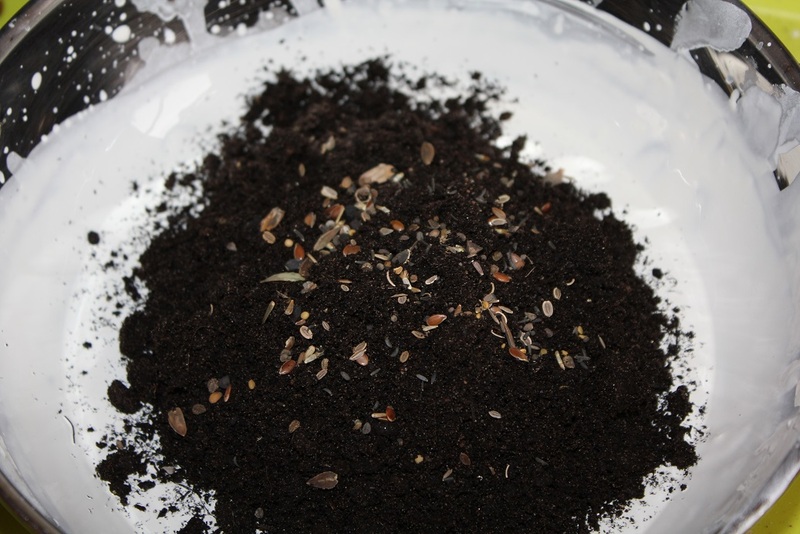 Mix compost and seeds in with the slip. 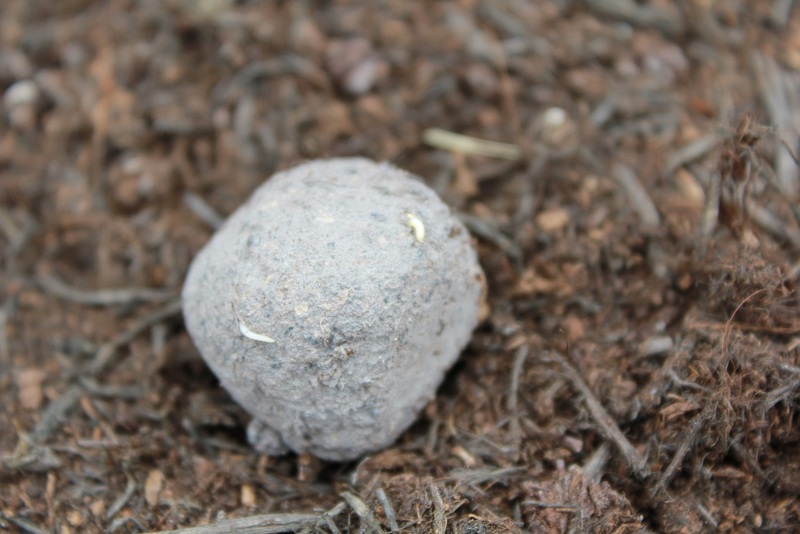 This should make you a nice pile of damp soil which can be rolled into ball shapes roughly one inch in diameter.